What is Countdown to Profits About? Gone Bust or Still Scamming! I came across a forum the other day where an individual was raving about the mega money he was making with this marvelous program. Curiosity got the better of me and I had to know just what is Countdown to Profits about? Much to my surprise this program seems to have disappeared off the interwebz! Why am I surprised? Because programs that generate that sort of hype are usually sucking in gullible people and making a killing so they tend to stick around. Why the skepticism and what happened to Countdown to Profits? Stick with me and I'll explain, plus I'll show you how to spot a scam and give you a better option you can start today, now that this "get rich quick scheme" has gone bust. If you are in a hurry and are after something in particular you can jump to individual sections using the Quick Navigation table below. Guaranteed Money Back or NOT! So what's the Alternative - How do you Make Money Online? Who’s It For: Well no-one now it doesn't exist anymore! OK so even though the product doesn't seem to exist the sales video is still lurking around the internet. Some things just refuse to die! I have include it here so you can see what to look out for when your searching for legit programs to help you earn online. Note the ridiculous sales hype! Warning sign #1 right there. I will go into other warning signs but as you watch the video just consider if you would have been interested in a system that promises you can earn $125,000 A MONTH! Did you notice that he refers to the program as Profit Stackers? Isn't this suppose to be a video about Countdown to Profits? Profit Stackers is one of his other programs and it must be remarkably similar if you can use the same video for both! Profit Stackers also doesn't seem to be available these days, but I am 100% certain that Richard Paul will be back with more so called "money making" programs in the future. Now obviously if you have found this review you are looking at various ways to help you make money online. And I can still help you with that so all is not wasted! But before we get to that let me explain what Countdown to Profits was and what signs clearly indicate a scam so as you search for a way to build an online business that will pay you, you don't fall into a scam. There are some fantastic legitimate ways to make real money online so don't be disheartened. They do exist and I will explain the way I am doing it shortly. After doing too many product reviews to mention covering both legit and scammy products I am finding it easier every day to spot a scam. They all have some of the same things in common, and you can spot them too, and save yourself a lot of heartache and lost money. The internet is littered with one page sites offering to show you how to make money for nothing, all designed to part you with your cash and give you nothing in return. From my research Countdown to Profits appeared to be a sales funnel for a much bigger scam called My Online Business Education (affectionately called MOBE for short). MOBE was shut down by the FTC in mid 2018 for deceptive practices. You can read all about that on my Internet Scammers - The List and without that it appears Countdown to Profits had nothing to offer and shut down also. First up anything that promises you thousands of dollars, or in this case $125,000 each and every month with only 4 hours work a week, is nothing more than a scam. Claims like these are always unsubstantiated because they simply can not be achieved by those new to the industry. Affiliate marketing is a legit way to earn money online and big money at that, but you are not going to do it by only putting in 4 hours a week and you won't do it in the first 30 days. By targeting those new to the industry who don't know that this can't be achieved these fraudsters get you to part with your money. They get rich and you do not! Leading people to believe that they can also make this sort of money is not only illegal it's unethical. And putting a disclaimer in fine print saying *we do not guarantee you will make the same amount of income just isn't good enough. Honestly I am the same as everyone else - the thought of making $125k each month and only doing a few hours work each week for it sounds phenomenal! I wish it were true, I'd be onto that in a shot if I thought it would work. Believe me when I tell you it is a complete fabrication! Now initially this might look like a good thing, and it would be if it wasn't for the fine print. So with Countdown to Profits they offered your money back if you didn't make a huge commission within 30 days plus you also got $500 from them just for watching the sales video. Sweet $500 to watch a 500 second video - yep that's $1 a second just to watch. BUT wait .... once you read the fine print it says the $500 payout and the money back are dependant on your work ethic, completion of their one of a kind training and other factors which can be discussed with your mentor! What the! So pretty much any reason means you don't get the $500 and you don't get your money back. READ THE FINE PRINT. There are often terms and conditions attached to the money back guarantees and also any upsells which come with the program. Make sure you read everything you can get your hands on before you part with your money. If like me you spend a lot of time scanning the internet for the next big thing or other ways to make money online you will start to come across the same profile pictures of the very same people. These are stock images, which are downloaded for free and then can be used anywhere and everywhere. So the image of Richard Paul can be seen on various different websites with various different names all of whom are a scam. If you are not prepared to put your image to your product you just come across as dodgy! And it occurred a couple of times through their website with the same image of a woman used with different names! So is she Sarah Johnston or Kate Weinstein! Either way you know you can't trust the testimonials either. These are all good indications that the product is a scam and you should keep your eyes out with every product, software or program that asks you to part with money if it has any of these tell-tale signs. Pricey Upsells - it starts cheap but you have to keep paying out money to be able to continue, or they withhold crucial information that you have to pay for to know what you are doing. Urgency Tactics - you know the sort only 3 places left, or the price will go up in 12 minutes. Do you really think if people are buying they are going to withdraw it or put the price up? No. No Clear Explanation of the Product - if you have nothing to hide you would explain completely and upfront exactly what the product does. Hyped up sales videos which actually tell you nothing are a feature of scams. Huge Price Drops - do you really think if people were prepared to pay $2000 for the product they would be offering it for $97? Mentors or Salespeople - a mentor is a wonderful thing, but a hyped up salesperson employed to talk you into buying more and more upsells is not a mentor. I would love to show you a better way if you are still interested in making money online. There is no hype and I won't promise you $9000 in your first 24 hours, but it is legitimate and real people are making full-time wages and much more from affiliate marketing. And better still you can check it out for yourself absolutely free of charge. There is no risk, no obligation to stay and no continuous upsells. The company I use and recommend want you to be completely comfortable that this is the right way for you to make money online that they give you 7 days to try it out for FREE. If you don't think it is for you during or after that time, no hard feelings, you simply walk away. You haven't added any credit card or Paypal details and you haven't signed up for any sort of upsells. You simply log out and don't come back. I don't think you can get fairer than that hey? If you would like more information about affiliate marketing plus a link to try this out for yourself click on the button below and if I can help you out in anyway please do drop me a comment in the box below. 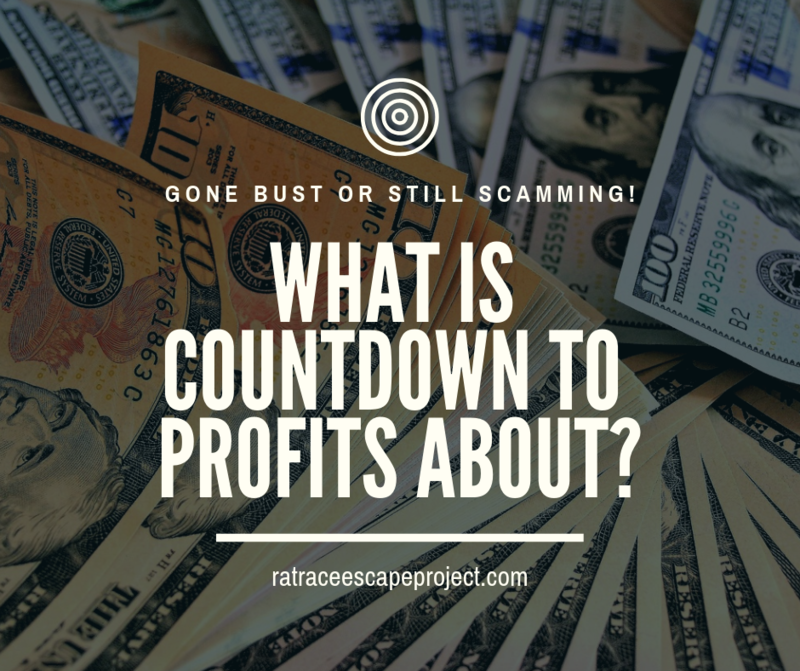 Did you get scammed by Countdown to Profits when they were around? Have you been scammed by any other programs you think we should know about? Drop us a comment, we'd love to be able to help others not make the same mistakes. This is yet another fly by night offer it appears or was, as you say it is not available anymore. The Countdown To Profits likely went down with the MOBE shutdown. I am not sure if you heard about that, but the FTC stepped in and accused them of scamming millions of dollars from unwary prospects. Even today, there are many tools, products, and services that simply do not live up to their advertised hype with income claims, ease of use, and features. That is a shame, because it throws shade on the market segment generally, and there are ethical means to make a living in the making money online market segment. The best advice I can give to someone who is looking for a viable and ethical platform to learn from is to do their due diligence. Google is your friend, and looking through some reviews prior to investing any money, time, or effort will save you lots of stress. Going beyond the reviews, I would also recommend looking through some forums and groups too, as often you will get some testimonials from people that have used the tool or product you are contemplating purchasing. These people can provide valuable insight. This particular program sounded like a questionable offer just with the name. There is a lot of thought put into these creators on how to trigger emotions that will cause viewers to open their wallets, but after 4 years in the market, I am immune to such tactics, and indeed, rather than pique my interest, often such colorful names raise a red flag for me personally. Good review and hopefully your readers will be better prepared to evaluate this and similar programs as an outcome of your information. Thanks! The MOBE takedown was certainly quite spectacular. There are ways people can now try to get their money back if they were scammed by MOBE so at least that is some progress. As you say the various names and the outrageous claims of income that can be made with no skill and little effort and in ridiculously short amounts of time raise reg flags to those of us who have been around a while. And it does cast a shadow across all online businesses, which is such a shame because there are worthwhile and honest products out there that can help anyone who wants to make money online and change their lives. This is a great review!! Very thoroughly done! I don’t know how some people can live with themselves, trying to scam people out of so much money. But thankful that this review has called them out!! Thank you for the information, and I will be on the lookout for crazy things like this. There are so many crazy scams out there, some of them are so blatantly obvious that I wonder if anyone falls for them, but apparently they do! I saw the picture of the car on your review and now I suddenly understand why my car pictures on Pinterest are always snapped up. I believe some of the people saving it are scammers who then use it on scams like Countdown to Profits. Because I recognise some of my pinned car pictures on those sites! I’m flabbergasted! Thank you for the post … reading reviews like yours help me weed out the scams from the solid platforms like your recommended program. Yes once you post something online unfortunately the not so savoury will take them and use them as they wish. There was a whole expose on a bloke who was hiring Porsches and mansions to video himself, passing them off as his own! People will go to great lengths to scam others. Pity they didn’t put as much effort into creating worthwhile products that would actually help people. Hopefully my review will help others to spot a scam and save their money. Thanks for stopping by for a read Salim. Products and programs that use hype to sell are almost always unreliable. A good program will tell you the truth upfront and not use unrealistic claims of profit to lure people into buying. The more I look around the more I find them and it is quite sad that people are losing their money to these guys when there are legit ways to make money online. My friend recently referred me to Countdown to Profits. Before using this platform I wanted to know if it was worth my time. Thank god I found this article. This article explains me every single information about Countdown to Profits. It was really helpful for me and helped me make a decision over this. From this article it looks like this is not worth the time. I’m more likely to try your recommended program after researching more about it. Glad it helped. 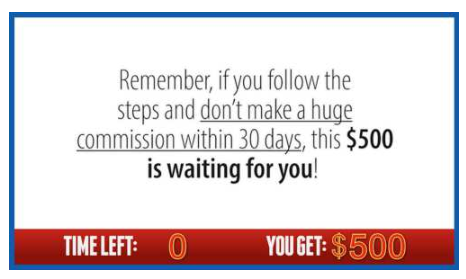 Unfortunately there are a lot of scams out there but there are some great programs too. I hope you will give WA a try, I am very glad I found them and am proud to promote them to others who want to make money online.